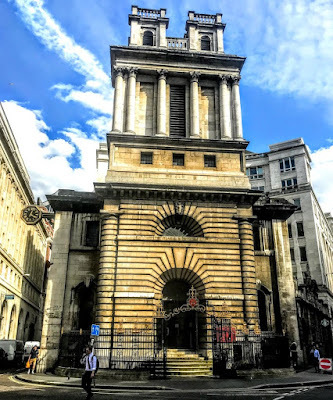 The Church of Saint Mary Woolnoth is an arresting landmark at the centre of the City of London, on the corner of Lombard Street and King William Street near Bank junction. The church is interesting as one of the Queen Anne Churches designed by Nicholas Hawksmoor, but also for its associations with many interesting people, including the founder of Lloyds Edward Lloyd, the abolitionist and hymnwriter John Newton and his friend William Wilberforce, and the poet TS Eliot. When I visited the church late one afternoon last week, an artist was paining a scene of the interior, and someone else was practising on the piano as sunshine streamed in through the windows and filled the church with light. This site has been used for worship for at least 2,000 years. Traces of Roman and pagan religious buildings were found under the foundations of the church, along with the remains of an Anglo-Saxon wooden structure. The full and unusual dedication of the church is to Saint Mary of the Nativity. The name of the church is first recorded in 1191 as Wilnotmaricherche. The name ‘Woolnoth’ may refer to a benefactor, possibly Wulnoth de Walebrok, a Saxon noble who lived in the area earlier in the 12th century. Alternatively, the name may be connected with the wool trade – this was so with the nearby church of Saint Mary Woolchurch Haw. The present church is at least the third church on the site. The Norman church survived until the mid-15th century, when it was rebuilt. The new building was consecrated in 1438, but additional work appears to have taken place towards the end of the century, and a spire was added in 1485. 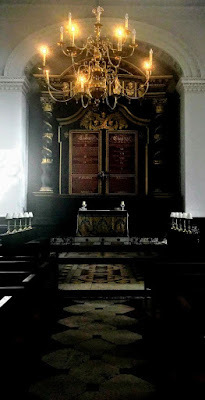 The advowson was given by the founder or his heirs to the Priory of Saint Helen, Bishopsgate. After the dissolution of the monasteries, Henry VIII gave it to Sir Martin Bowes of Lombard Street, a goldsmith and Lord Mayor of London in 1545-1546. The advowson passed from Bowes to the Goldsmiths’ Company, and the patronage subsequently passed through various hands. The church was badly damaged in the Great Fire of London in 1666, but was partially rebuilt by Sir Christopher Wren in 1670-1675. Sir Robert Vyner, Lord Mayor of London in 1674, made a major contribution to the cost of this work, and the church was known at one time known as Sir Robert Vyner’s church. Vyner had his own entrance to the east end of the church, a privilege inherited by the Post Office which later stood on the site of his mansion in Lombard Street. Two new bells, the treble and the tenor, were cast in 1670, and in 1672 the middle bell was cast. 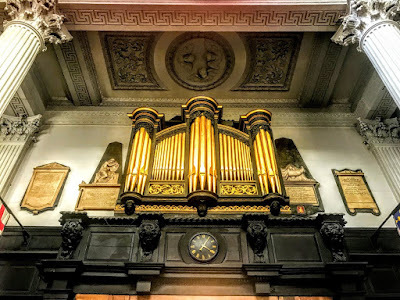 The original west organ gallery with organ case is dated 1681. Nearby Saint Mary Woolchurch Haw was destroyed in the Great Fire of 1666. It was not rebuilt, and its parish was united with Saint Mary Woolnoth. The style of the church was described as ‘modern Gothick’ in 1708. But Saint Mary Woolnoth was only partially-repaired by Wren. The building became unsafe and in 1711 it was decided to build a new church under the Fifty New Churches Act – the only church in the City to be built under the Act. By 1712, the condition of the church was so dilapidated that the parishioners were afraid to worship there, and repairs to the existing structure were undertaken. 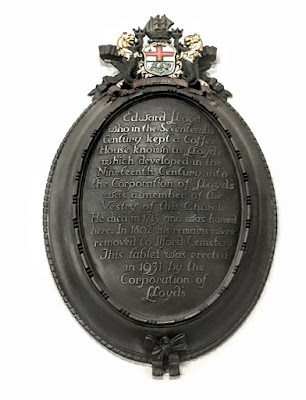 Edward Lloyd, the founder of Lloyd’s of London, was a member of the vestry at the time. He founded Lloyd’s coffee house, which later developed into Lloyd’s Corporation. When he died in 1713, he was buried in the crypt, although the site was going through a radical transformation. The church was rebuilt by the Commission for Building Fifty New Churches. Work began in 1716, when excavations uncovered remains thought to be Roman, and there is evidence of major Roman buildings in the immediate vicinity. The new church opened for worship on Easter Day 1727. It was designed by Nicholas Hawksmoor, assisted by John James. 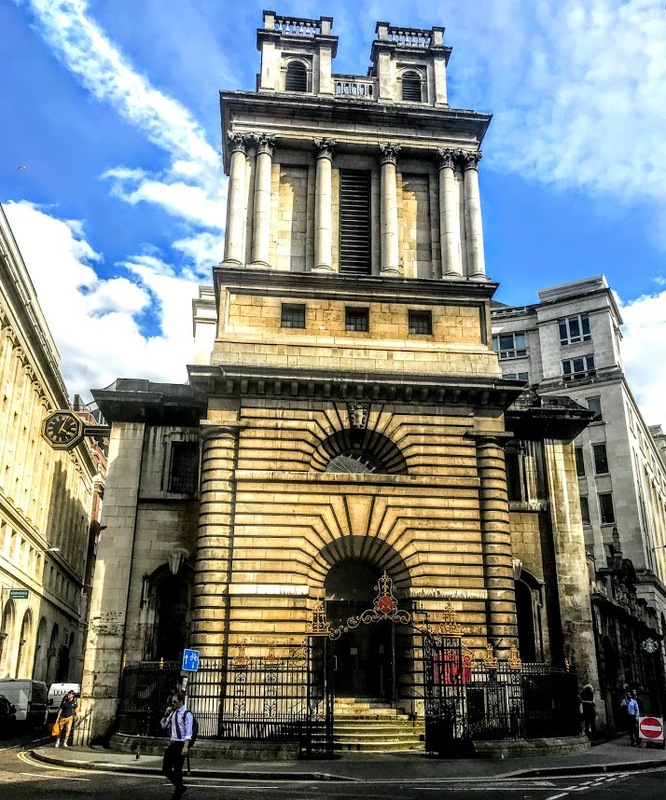 It is one of Hawksmoor’s most distinctive and original designs and his only church in the City of London. Hawksmoor designed an unusually imposing façade in the English baroque style. It is dominated by two flat-topped turrets supported by columns of the Corinthian order, which are used throughout the church. The west side of the façade, facing Lombard Street, has distinctive recesses bearing an inset forward-curving pediment resting on skewed columns. Hawksmoor’s treatment of the north elevation has been described as ‘a piece of sheer architectural eloquence hard to match’ (John Summerson, Georgian London, 1945). The absence of windows on this wall insulates the interior from the noise of Lombard Street. Despite its small size, the church is surprisingly spacious inside. The layout is typical of Hawksmoor, forming a ‘cube within a cube,’ or a square enclosed by three rows of four columns that is itself enclosed by a wider square. In the shallow chancel, an ornate, baroque wooden baldacchino with twisted columns and canopy ornamented with gilded cherubs, was made by John Meard and carved by Gabriel Appleby. It was modelled on Bernini’s baldacchino in Saint Peter’s Basilica in Rome. 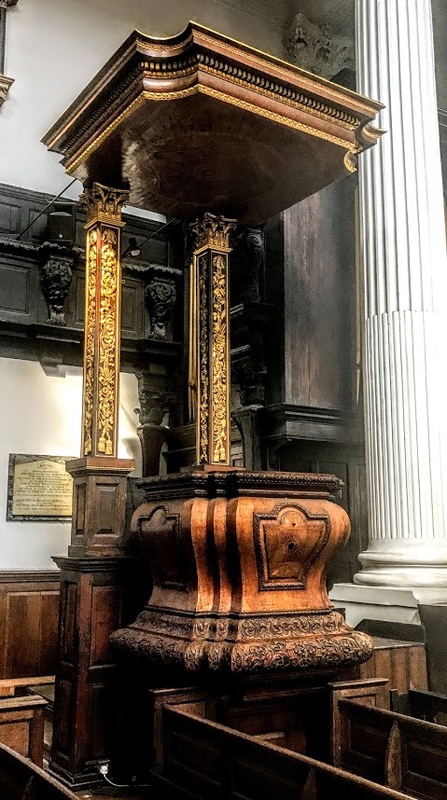 The pulpit, with its unusual bulging shape, was made by Thomas Darby and Gervaise Smith and is inlaid with sunbursts by Appleby. The tester echoes the shape of the ceiling. The galleries were made by Meard and carved by Darby and Smith. 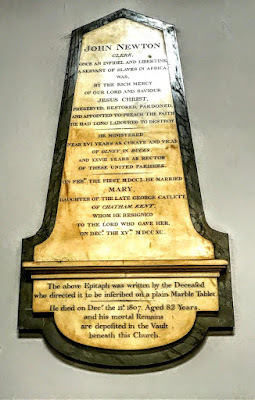 The Revd John Newton (1725-1807), the former slave trader who became an abolitionist and evangelical and hymn writer, was the Rector of Saint Mary’s Woolnoth from 1780 to 1807. His best-known hymn is Amazing Grace, and his parishioners included the anti-slavery campaigner William Wilberforce (1759-1833). John Newton, Clerk. Once an infidel and libertine, a servant of slaves in Africa, was, by the rich mercy of our Lord and Saviour Jesus Christ, preserved, restored, pardoned, and appointed to preach the faith he had long laboured to destroy. The church was threatened with demolition on several occasions but was saved each time. Its galleries were removed by William Butterfield in 1875-1876, who thought they were unsafe, and a number of other significant changes to the interior were made at the time. Butterfield raised the chancel, forcing the baldacchino high into the elliptical chancel arch. The polychromatic flooring of the chancel also dates from this time. Between 1897 and 1900, the City & South London Railway (C&SLR) built Bank Underground station beneath the church. The company had permission to demolish the church, but public outcry forced the company to think again. The crypt was sold to the railway and the bodies there were moved for reburial at Ilford, including Edward Lloyd. 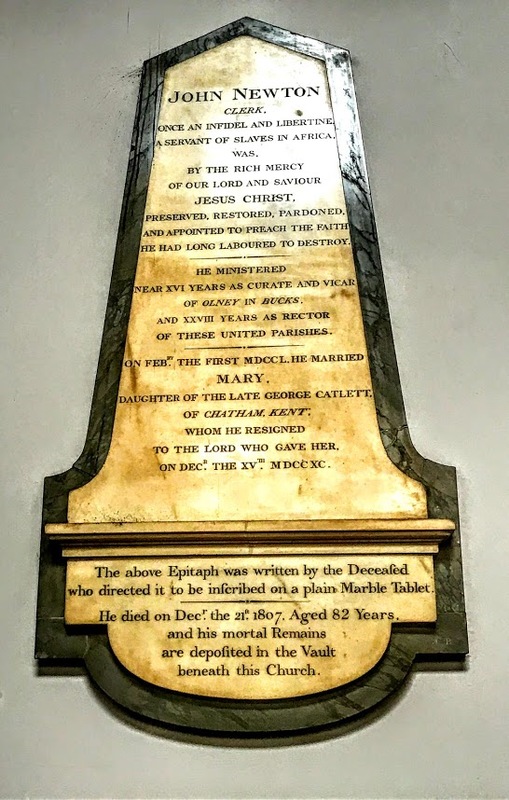 However, the bodies of John Newton and his wife Mary (Catlett) were reburied at Olney, where he had been a curate and then vicar before moving to London, in 1893. The crypt and plinth of the church were used as a booking hall in 1897-1900. The walls and internal columns of the church were then supported on steel girders while the lift shafts and staircase shaft for Bank station were built directly beneath the church floor. At the same time, the bells were also rehung with new fittings. The lower part of the south elevation is now masked by the single-storey former Underground station entrance, with a new vestry, in a style that pays tribute to Hawksmoor. A second organ, dated 1913, is placed at the east end of the north aisle. “Or with his nails he’ll dig it up again! Saint Mary Woolnoth was the only City church to survive World War II unscathed. The church was designated a Grade I listed building on 4 January 1950, and it became a guild church in 1952. The church is the parish church of the Lord Mayors of London. The Mansion House stands almost opposite, on the site of Saint Mary Woolchurch Haw. This association helped protect the church from repeated threats of demolition between 1863 and 1926. Saint Mary Woolnoth is the active parish church for the combined parish of Saint Edmund the King and Martyr, and Saint Mary Woolnoth Lombard Street with St Nicholas Acons, All Hallows, Lombard Street, Saint Benet Gracechurch, Saint Leonard Eastcheap, Saint Dionis Backchurch and Saint Mary Woolchurch Haw – usually shortened to ‘St Edmund & St Mary Woolnoth,’ Saint Mary Woolnoth and Saint Edmund are the only two churches in this list to have survived. 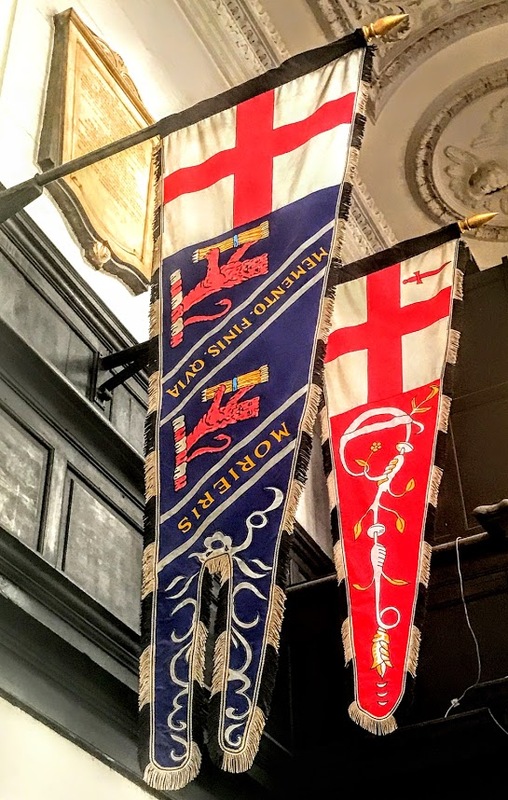 The Church of Saint Mary Woolnoth continues to be used actively, with celebrations of the Holy Communion every Tuesday. The church is used by the German-speaking Swiss community in London, and is also the official church in London of the government of British Columbia. Close to Saint Paul’s Cathedral and the Millennium Bridge, the Saint Lawrence and Saint Mary Magdalene Drinking Fountain on the east side of Carter Lane Gardens is an unusual and richly decorative work of Victorian street furniture. 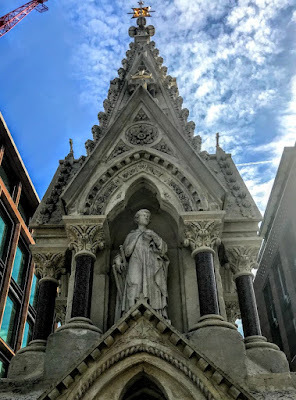 I took some time to appreciate the fountain last week while I was walking between Liverpool Street station and the offices of USPG in Southwark. With its Gothic design and its sculptures, it recalls a time when the provision of clean, freely accessible, drinking water in towns and cities on these islands was a valued, and often lavishly made, philanthropic gesture. The Saint Lawrence Jewry fountain is a Grade II listed monument. 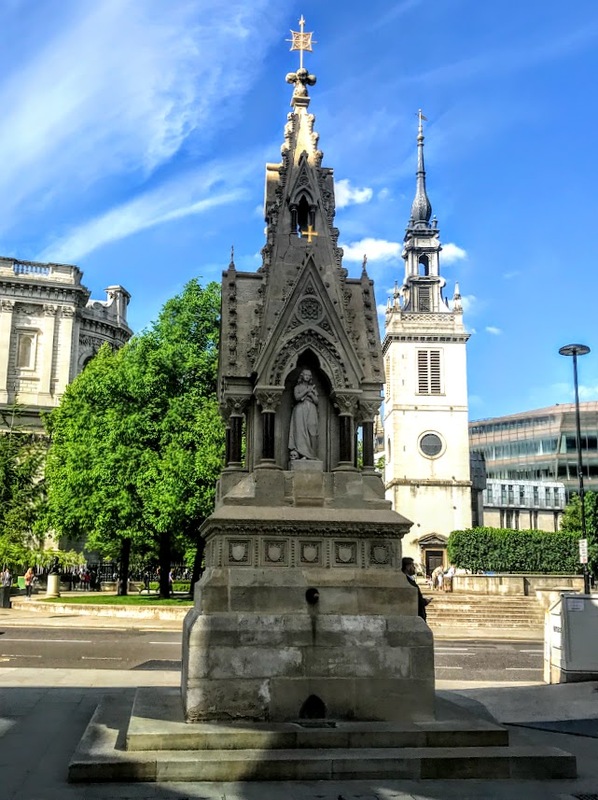 It was originally installed in 1866 outside the Church of Saint Lawrence Jewry, in Church Passage, to the immediate west of Guildhall Yard in the City of London. Saint Lawrence Jewry is a guild church on Gresham Street, next to Guildhall, and is the official church of the Lord Mayor of London. The church was originally built in the 12th century and dedicated to Saint Lawrence. The weather vane on the present church is in the form of gridiron, the instrument of his martyrdom. The church is near the former mediaeval Jewish ghetto in London, which was centred on the street named Old Jewry. From 1280, Balliol College, Oxford, was the patron of the church. Sir Thomas More preached in the older church. This church was repaired in 1618, when all the windows filled with stained glass paid for by individual donors. The mediaeval church was destroyed in the Great Fire of London in 1666 and was rebuilt by Sir Christopher Wren between 1670 and 1687. The church suffered extensive damage during the Blitz on 29 December 1940, and after World War II, the City of London Corporation agreed to restore it as Balliol College did not have the funds needed. The church was described by Sir John Betjeman as ‘very municipal, very splendid.’ It was designated a Grade I listed building on 4 January 1950. It was restored in 1957 by Cecil Brown to Wren’s original design. In the early 19th century, water supplies to London and other large towns and cities were inadequate for the needs of the population, badly contaminated, and responsible to a great degree for the high mortality rate. The Metropolitan Water Act (1852) brought about in a marked improvement, but supply was far from ideal and outbreaks of cholera continued. Philanthropic bodies and civic amenity groups played a significant role in improving sanitary conditions from the 1850s on, particularly through providing water fountains. These organisations included the Metropolitan Free Drinking Fountain Association, founded in 1859, which established a great number of drinking fountains that provided free, clean, water to all. 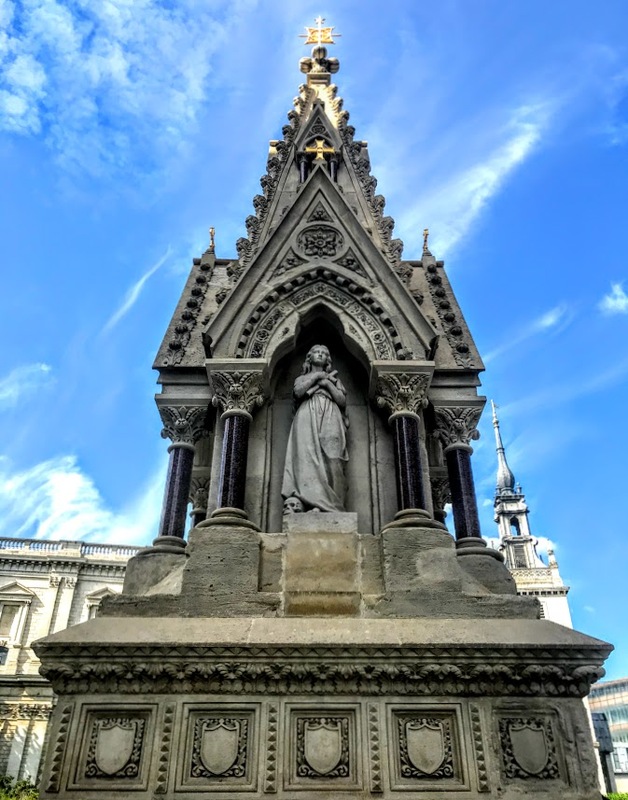 The Saint Lawrence Jewry fountain was erected by the parishes of Saint Lawrence Jewry and Saint Mary Magdalene. The fountain was designed by the architect John Robinson (1829-1912). Robinson studied at the Royal Academy and became the pupil of Sir James Pennethorne (1801-1871), chief architect at the Office of Works and a student of both the Regency architect John Nash (1752-1835) and AWN Pugin. When Pennethorne retired, Robinson established his own practice at Carteret Street in Westminster. Robinson’s works were varied, including office, hotel and domestic buildings, interior schemes, and several memorial structures. The sculptural work on the fountain is the work of Joseph Durham (1814-1877), a noted Victorian sculptor. Durham studied under John Francis before working for Edward Hodges Baily, the sculptor of Nelson’s Column in London. He was working independently by about 1835 and one of his first major commissions was the memorial to commemorate the Great Exhibition of 1851. The contractor was William Thomas. The fountain is built with Portland stone with polished pink granite columns, and a bronze relief sculpture. It is square in plan, about 9.5 metres high and 2.7 metres wide, with the fountain element projecting from the north face. It stands on two low steps. The fountain has an elaborate Gothic style. A substantial base, about two metres high, carries a canopy formed of four hooded niches and a central sprocketed spire. A band of carved shields runs around the top of the base. The niches have trefoil arches, with the hoods over being steeply pitched and sprocketed, with a pointed arch and foliate designs carved into the tympana. The hoods are supported by granite columns with stiff leaf capitals. In the north-facing niche is a carved stone statue of Saint Lawrence holding a grid iron, on which he was martyred. In the south-facing niche is a statue of Saint Mary Magdalene holding a cross, and with a skull at her feet. The other two niches are empty but are believed to have originally held the names of past benefactors of the churches carved into white marble slabs. The fountain is on the north face of the monument and takes the form of a niche with carved hood resting on granite columns. Set into the niche is a bronze bas-relief of Moses striking the Rock at Horeb (Exodus 17: 4-6), water runs down the face of the bronze from where Moses’ staff strikes the rock. To the left of Moses is the figure of a woman holding a cup of water to her child’s mouth. The water flows into a shallow stone bowl that projects out from the fountain and is supported on a broad granite column with a stone base. 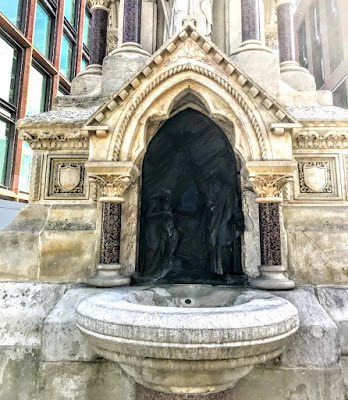 City / of / London / The St Lawrence & Mary Magdalene drinking fountain / commissioned by the united parishes of / St Lawrence Jewry & St Mary Magdalene / originally located in the Guildhall Yard / outside the Church of St Lawrence Jewry from 1866 to 1970 / designed by architect John Robinson and sculptor Joseph Durham / Restored and relocated here in 2010. 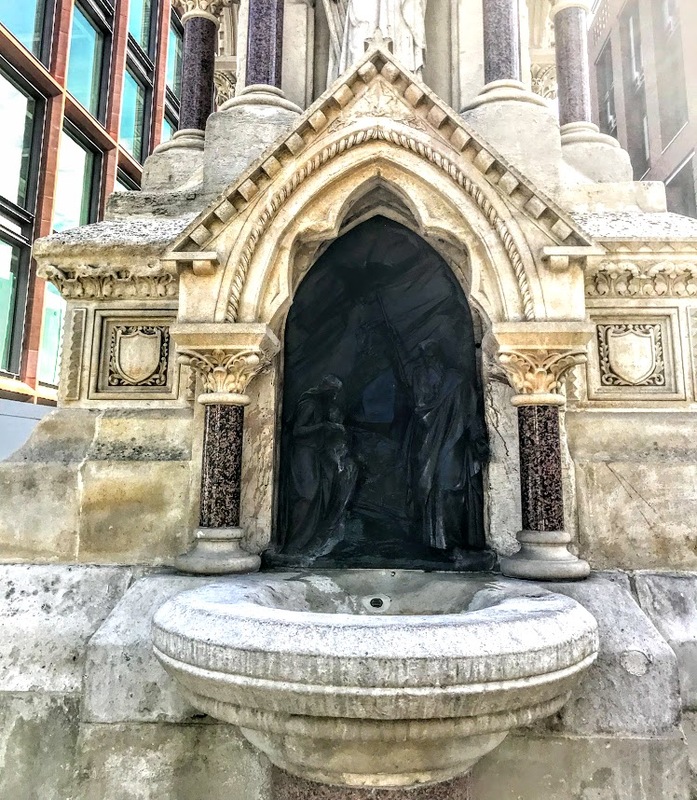 The fountain remained in its original location until 1970, when the redevelopment of Guildhall Yard forced its removal. It was dismantled into 150 pieces and put into storage with the intention to re-erect it at a later date. But it remained in a city vault for 15 years, and it was then stored in a barn at a farm in Epping. The pieces were sent to a foundry in Chichester for reassembly in 2009, when much of the stonework had to be replaced. 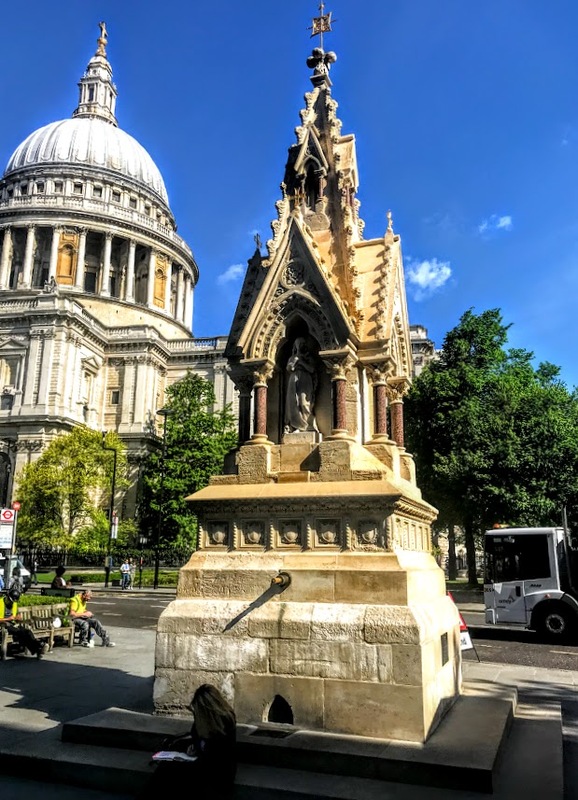 It was moved in 2010 to its present location, at the north end of Carter Lane and to the south of Saint Paul’s Cathedral. ‘Thy Kingdom Come’ is an invitation to pray with Christians around the world during the nine days between Ascension and Pentecost, using art and scripture. ‘Changed Lives → Changing Lives’ is the guiding theme this year as people are invited to pray afresh for the coming of the Holy Spirit at Pentecost. In doing so, people are joining thousands of others around the world as part of ‘Thy Kingdom Come’ – an initiative encouraging people to explore through prayer how they might courageously witness to God’s life-changing work. As the Apostles prayed together following Christ’s Ascension, waiting for the Holy Spirit to come at Pentecost, we too are invited to wait and pray today. They prayed in obedience, trusting that the way ahead would be revealed. May we, like the disciples, pray anticipating that the Spirit will show us new ways of living and loving. ‘Thy Kingdom Come’ asks that we may we be open to where God leads us, to be the change God wants to see in the world – whatever that might require. As God is at work in us, he is also at work through us changing the lives of others. Please join with us as we pray together: ‘Come Holy Spirit: thy kingdom come’ and may our waiting and praying this Novena open our hearts afresh to God’s possibilities. LOOK at images and meet the characters caught up in life-changing moments, where the future is shaped by their encounter with God. They suggest letting those images reveal new possibilities for God’s Word to transform us and others. WAIT prayerfully for the Holy Spirit. Pause, creating a space into which God can speak. READ the Bible text, allow it to enliven your heart, stir your soul and spark your imagination. LISTEN for insight through idea or image, through recollection or curiosity. Let that Word dwell within you, as you listen for yourself and your community. RESPOND to the prompting of the Word, with an action that leads to life-giving change. Let the words of the collect gather up and bless these moments of prayerful waiting upon God, so his Kingdom might be seen more fully in you. LOOK … and be curious. WAIT … with prayerful expectation. READ … the text with an open mind. LISTEN … for a word with a willing heart. RESPOND … with prayer and action. Oh God of invitation, as we stand at the door, as we ask the hard questions, as we search you out, may we sense you already at work preparing a feast of answers, drawing us over the threshold and satisfying all our hungers.